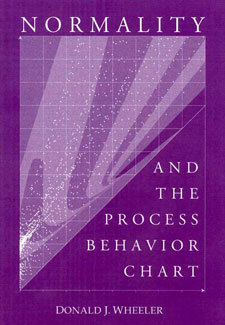 Having a normally shaped histogram is not a prerequisite for placing your data on a process behavior chart. Neither is it inevitable that a predictable process will display a mound shaped histogram. This book provides the first careful and complete examination of the relationship between the normal distribution and the process behavior chart. It clears up much of the confusion surrounding this subject, and it can help you overcome the superstitions that have hampered the effective use of process behavior charts. Dr. Wheeler, thank you for giving me four great days! Your teaching was a model of clarity, power, and precision.